On July 19, 1945, future Little Rock City Manager Mahlon A. Martin was born in Little Rock. After graduating in 1963 from Horace Mann High School, he attended Philander Smith College. (He had received a baseball scholarship to Grambling, but chose to remain in Little Rock to be near his ailing grandmother.) Martin graduated from Philander Smith in 1967 with a degree in business administration. After working in the private sector for two years, Martin was hired by City Manager Jack T. Meriwether to work for the City of Little Rock in 1969 after the City had received a Model Cities grant. Martin started working with community organizations and then became promoted to the City’s recruiting officer. In 1972, he was named to leadership posts at the four-county Central Arkansas Manpower Program. Three years later, he returned to the City of Little Rock to work on the staff of City Manager Carleton McMullin. In 1976, Martin was named Assistant City Manager for Little Rock. Martin left City Hall in 1979 to become a top executive at Systematics, Inc. However, his stint in the private sector was short-lived. In 1980, the City Board of Directors asked him to come back and be Little Rock’s sixth City Manager. At thirty-four, he was one of the youngest chief administrators of a major city in the country and the first African American City Manager for Little Rock. In 1983, Governor Bill Clinton asked him to join the state of Arkansas as the Director of the Department of Finance and Administration. He was the first African American to lead that or any major Arkansas state department. Throughout his tenure with the State, he oversaw numerous initiatives to restore the state to sound financial footing. Martin joined the Winthrop Rockefeller Foundation as president in 1989. He held that position until his death in 1995. In 2001, Mahlon Martin was posthumously inducted into the Arkansas Black Hall of Fame. A decade later, the Butler Center for Arkansas Studies created a fellowship in his memory. It supports research and programming in the field of public policy in Arkansas. In 2015, he was included in the Arkansas Civil Rights Heritage Trail. Mahlon Martin Jr., City Manager Bruce T. Moore, Honorable Lottie Shackelford, Charles Bussey Jr. The new Arkansas Civil Rights History Audio Tour was launched in November 2015. Produced by the City of Little Rock and the University of Arkansas at Little Rock allows the many places and stories of the City’s Civil Rights history to come to life an interactive tour. This month, during Black History Month, the Culture Vulture looks at some of the stops on this tour which focus on African American history. The Arkansas Civil Rights Heritage Trail was launched in 2011 by the UALR’s Institute on Race and Ethnicity. Each year, a theme is chosen to honor a particular group of people who were active in Arkansas’s civil rights movement. Year by year, the trail grows. The plan is that over time the trail will stretch from the current starting point at the Old State House, down West Markham Street and President Clinton Avenue to the Clinton Presidential Library and Museum, and then back up the other side of the street to opposite the Old State House. Politics and Law have been two central pillars in civil rights struggles. The honorees contributed to those struggles in Arkansas in a number of ways. Annie Mae Bankhead was a community activist in Little Rock’s black College Station neighborhood; Charles Bussey was Little Rock’s first black mayor; Jeffery Hawkins was unofficial mayor of Little Rock’s black East End neighborhood; I. S. McClinton was head of the Arkansas Democratic Voters Association; Irma Hunter Brown was the first black woman elected to the Arkansas General Assembly; Mahlon Martin was Little Rock’s first black city manager; Richard L. Mays and Henry Wilkins III were among the first blacks elected to the Arkansas General Assembly in the twentieth century. Lottie Shackelford was Little Rock’s first black woman mayor; Wiley Branton was head of the Southern Regional Council’s Voter Education Project in the 1960s; William Harold Flowers laid the foundations for the Arkansas State Conference of NAACP branches; Scipio Africanus Jones defended twelve black prisoners after the 1919 Elaine Race Riot; Olly Neal was the first black district prosecuting attorney in Arkansas; and John Walker for over five decades has been involved in civil rights activism in the courts. The app, funded by a generous grant from the Arkansas Humanities Council, was a collaboration among UALR’s Institute on Race and Ethnicity, the City of Little Rock, the Mayor’s Tourism Commission, and KUAR, UALR’s public radio station, with assistance from the Little Rock Convention and Visitors Bureau. 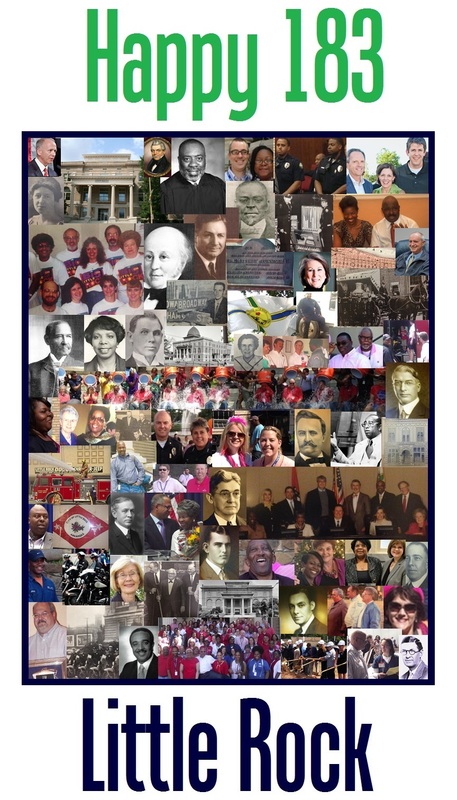 Posted in Black History Month, Government, History, LR Look Back	| Tagged Annie Mae Bankhead, Arkansas Civil Rights History Audio Tour, Arkansas Humanities Council, Black History Month, Charles Bussey, City of Little Rock, Henry Wilkins III, I.S. McClinton, Irma Hunter Brown, Jeffrey Hawkins, John Walker, KUAR, Little Rock Convention & Visitors Bureau, Lottie Shackelford, Mahlon Martin, NAACP, Olly Neal, Richard L. Mays, Scipio A. Jones, UA Little Rock, UA Little Rock Institute on Race and Ethnicity, University of Arkansas at Little Rock, W. Harold Flowers, Wiley Branton Sr.
Last month, the University of Arkansas at Little Rock Institute on Race and Ethnicity unveiled the 2015 Arkansas Civil Rights Heritage Trail markers. This year’s theme is “Politics and Law” to commemorate the 50th anniversary of the passage of the Voting Rights Act of 1965. The fourteen new markers are installed at Scott and Markham Streets near the Statehouse Convention Center. Established in the summer of 2011, the Arkansas Civil Rights Heritage Trail honors those who made significant contributions to civil rights in Arkansas. The trail raises public awareness of the long and rich legacy of Arkansas’s civil rights history. A 12-inch bronze marker is placed in the sidewalk for each honoree. The trail begins in front of the Old State House Convention Center on Markham Street and will eventually extend to the William J. Clinton Presidential Center and Park and other points throughout the downtown corridor. Dr. John Kirk is the director of the Institute. At the November ceremony, he spoke along with UALR Chancellor Joel Anderson. At a reception following the ceremony, Senator Joyce Elliott gave a toast in honor of the 14 and several of the honorees or their descendants spoke. Posted in Government, History	| Tagged Annie Mae Bankhead, Arkansas Civil Rights Heritage Trail, Charles Bussey, civil rights, Civil Rights Heritage Trail, Henry Wilkins III, I.S. McClinton, Irma Hunter Brown, Jeffrey Hawkins, Joel Anderson, John Kirk, John Walker, Lottie Shackelford, Mahlon Martin, Olly Neal, Richard L. Mays, Scipio A. Jones, UA Little Rock, UA Little Rock Institute on Race and Ethnicity, University of Arkansas at Little Rock, W. Harold Flowers, Wiley Branton Sr.
With the stroke of Territorial Governor John Pope’s pen, Little Rock was officially chartered as a town on November 7, 1831. This followed approval by the Arkansas legislature a few days earlier. As a chartered, officially recognized municipality, the Town of Little Rock was authorized to create a government and to plan for a Mayor and Aldermen to be elected. That election would take place in January 1832 with the initial council meeting later that month. There are several earlier and later days which could be used to mark Little Rock’s official birth (LaHarpe sighting in 1722, first settler in 1812, permanent settlement in 1820, selection of trustees in 1825, chartered as a City in 1835, chartered as a City of First Class in 1875) — but it is November 7, 1831, which has been the officially recognized and accepted date. In 1931, Little Rock celebrated her centennial with a series of events. Likewise, in November 1981, Little Rock Mayor Charles Bussey signed and City Clerk Jane Czech attested Resolution 6,687 which recognized the Little Rock sesquicentennial.